A Twitter town hall, or Twitter chat, is an event where agencies invite public engagement for a scheduled time period during which users can ask questions or find out more information about a topic via Twitter, much like a webinar. The questions are tagged with a pre-designated hashtag, and the agency responds to questions using the hashtag, follows-up via a blog post, or uses another digital means of meaningfully responding to the engagements. A Twitter town hall allows you to leverage Twitter, beyond the basics of sending messages and engaging in dialogue. Many agencies across government have used Twitter town halls and chats for years to bring their mission directly to the public by answering questions, soliciting feedback, or collaborating on ideas. Promotion for your Twitter chat should match the level of engagement desired and profile of the topic and host. For example, if this is your first Twitter chat, you may not want to promote it as heavily, in order to keep engagement at a manageable level and give your agency the chance to familiarize itself with the process in a live environment. If you are already comfortable with the process, and have a senior executive participating as the host, you will want to spread the word weeks in advance, through all available communication channels in order to draw the maximum amount of engagement to the hashtag. Blog posts describing the purpose of the chat and ways to participate, such as what the Department of Housing and Urban Development did for its first Twitter chat. Daily tweets from your agency accounts that link to the promotional blog to familiarize the public with your hashtag. Press notices to news sources alerting them to the upcoming event. All promotional communications should encourage the public to begin asking questions on the hashtag immediately—after all, if the goal is to encourage the public to engage and ask questions, you don’t need to wait for the start of your event to begin the process. This also allows you to stockpile questions in advance, in case they are slow coming at the beginning of the chat. As in any use of social media by government, it is important to clearly define what the expectations and policies are for the engagement. This can be accomplished through a blog post before the event, which can be distributed during introductions, or as part of your overall citizen engagement strategy. Many successful Twitter town halls focus attention on one topic, such as the Department of Housing and Urban Development’s sustainable communities (see example below) or the Department of Education’s Federal Student Aid team’s role in student aid (see example below. The more open–ended your request for engagement is, the more unrelated the responses will be. Also, defining a topic helps you gather the right subject-matter experts to answer the questions. 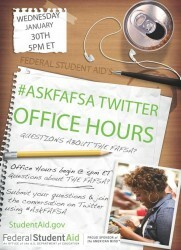 For example, the FAFSA team wanted a Twitter chat for Public Service Recognition Week. Through #AskFAFSA, they scheduled an event that focused on key programs related to that topic, such as the Federal Student Loan Repayment Program and the Post 9/11 GI Bill. As a result, they were also able to schedule special guests from the Department of Veterans Affairs and the Partnership for Public Service to answer questions on these topics. The purpose of the chat was clearly defined, which allowed for better preparation and staff support. If a participant on Twitter asked a question unrelated to the chat, expectations for when and how that question would be handled were clearly communicated to both the organizers of the event and the public. Especially for agencies new to Twitter chats, it takes a team to most effectively execute an event—and that team needs to be in contact throughout the course of the engagement. The Host: In addition to a tracking hashtag, every Twitter chat needs a clearly defined “host account” the public can look to in case the hashtag is overrun or improperly used. The host may be an agency account, or it may be the personal account of a senior leader or program manager. The Policy Wonk: Whatever the topic, your host needs someone on hand who knows the subject matter in detail and can pull up related blog posts to share with the audience. This improves the quality of your agency responses and removes the urgency placed on the host to both formulate responses and research them. This person should also shorten any links anticipated as important by shortening them with Go.USA.gov. The Social Media Manager: No matter how tech–savvy the host and policy wonk may be, your agency needs a coordinator dedicated to monitoring the tool, identifying questions, and seamlessly expediting between the public, the host and the policy wonk. This role is especially critical for spotting trends such as improper use of the hashtag, improper engagements, or otherwise ensuring the flow of the event. The Co-Host: Consider having a co-host. A co-host can officially or unofficially help follow-up on responses after the host has moved to the next question, direct unrelated questions to a more appropriate area, and ensure minimal dead space during the dialogue. The co-host role can be filled by an official agency account or unofficially by a social media specialist. General Counsel: It is always beneficial to invite the attorney from your agency who works on social media to observe. The attorney can help mitigate risks in some cases. But more importantly, he or she is present to witness citizen engagement and can help build your agency’s institutional knowledge. The key to a successful event is for everyone supporting the live chat to remain in contact during the event, either in the same room, by conference call, or in a video chat service (such as a Google+ Hangout). If staff can’t be in verbal contact, it may be necessary to revisit the planning of your Twitter chat until they can. During a Twitter chat all participants’ eyes will be focused on the hashtag, researching answers or compiling responses. Don’t rely on other forms of digital messaging to communicate during the event. You risk overlooking or ignoring messages that are critical to success. If your agency invites citizens to ask questions, be sure to answer all related questions, during or after the event. A best practice is to always follow–up your Twitter chat with a blog post, such as a Storify, that curates the questions and answers from the chat, and also answers additional questions asked before, during or after the event. 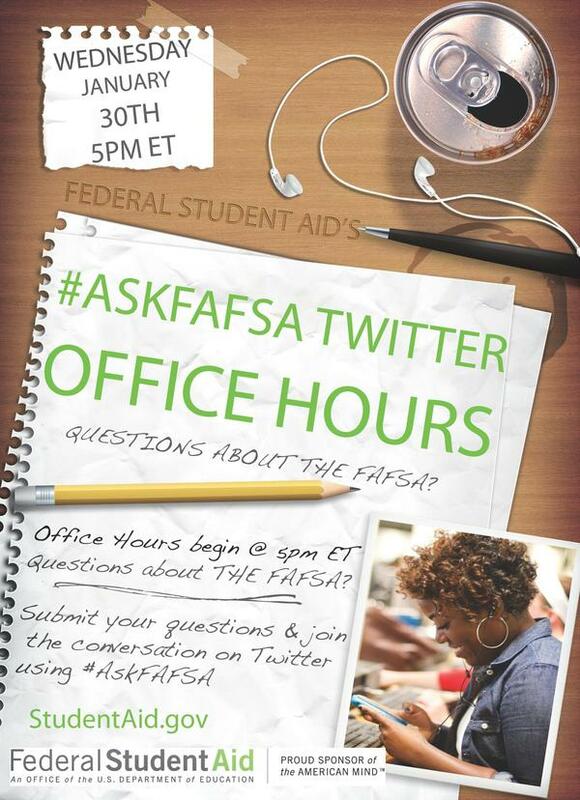 The FAFSA team states that they respond to questions via their blog. This makes it clear that their public’s time is valuable and their questions are heard. Plan for extra time in the agenda so if time runs short, your participants know that what matters most is engaging with them, and not abiding by an arbitrary time limit. This extra time, which can be managed by the co–host, is critical for meeting the expectations of engagement in case there are technical issues during your Twitter chat. Problems always arise, but by adding additional time, your customers don’t miss out. Performance metrics build institutional knowledge and illustrate the impact of your Twitter chat. As you refine your strategies, you will want to better demonstrate how your Twitter chats are improving customer services or reducing costs. HealthFinder.gov—The Department of Health and Human Services’ @HealthFinderprogram created an in-depth yet easy-to-follow agency guide for hosting a Twitter chat (PDF, 148 KB, 20 pages, February 2012). By applying lessons learned, they are able to host chats (almost weekly) based on diverse program areas. Take a look at how their policies and strategies are communicated through this guide, and consider how it can be customized and scaled for your agency. Department of Housing and Urban Development—To celebrate the first anniversary of HUD’s Open Government Plan, their Office of Innovation and Open Government worked with the Office of Public Affairs to organize a discussion on the department’s progress in the past year and forecasting for the coming year. The event was focused and well supported by staff—a successful first step into this style of engagement. HUD expanded the scope and profile of its Twitter chats as evidenced in their Strong Cities, Strong Communities Twitter Town Hall.